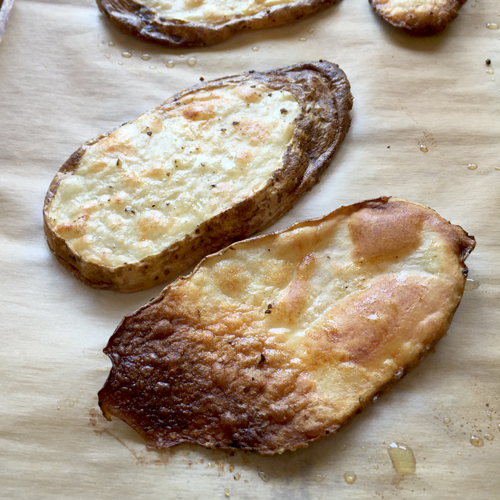 Crisp and tender baked potato planks. All you really need to know about these is that they are delicious--crispy and salty on the outside, tender and fluffy on the inside. Plus, they're super easy. I think I started making these as a bun substitute for my gluten-limited son's sloppy joes. He'd pile on the sloppy joe meat and eat it like an open-faced sandwich. The whole family enjoys them so much though, that they've made it onto our regular side rotation for all kinds of dinners. I bake mine on a sheet of parchment on my ever-present baking stone, but they would be fine on a baking sheet too. They're better than oven fries because they bake more evenly, I think. 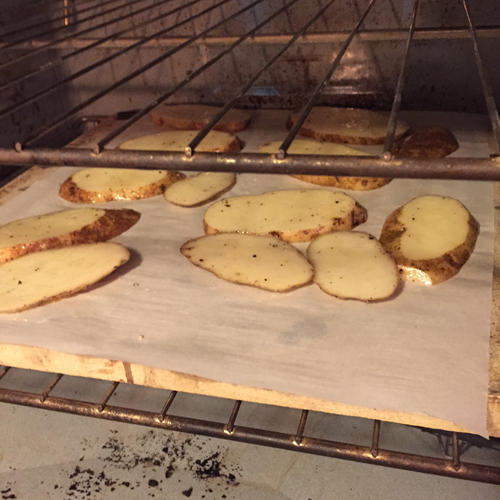 My oven fries tend to dry out and burn in some places, but are raw in others. At any rate, these are a nice side, AND you can adjust the level of oil (fat) according to your health needs. 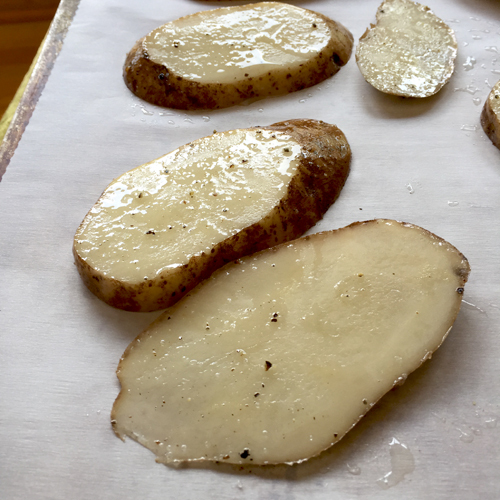 Slice the potatoes lengthwise into 1/4 inch planks and press cut sides onto a clean paper towel to absorb excess water. 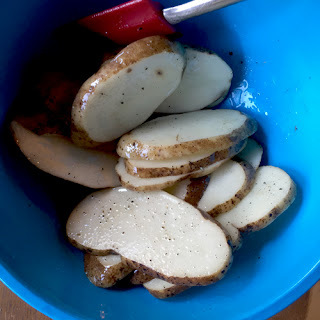 Place cut and dried potato planks in a large bowl. Add oil, salt, and pepper to the bowl. (Generally, use 1 tablespoon of oil per medium size potato. Add a little more oil if you want to make sure they get crisp.) 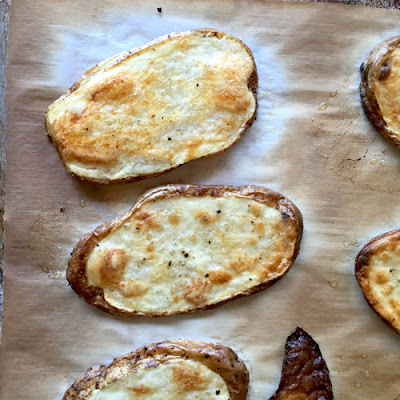 Toss with hands or a silicone spatula to coat both sides of each potato plank. 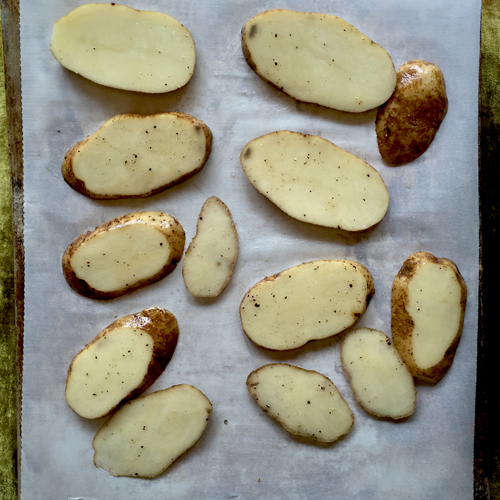 Place potato planks in a single layer onto the parchment. If using the baking stone, slide the parchment with the potatoes onto the baking stone. If no baking stone, place pan in oven. 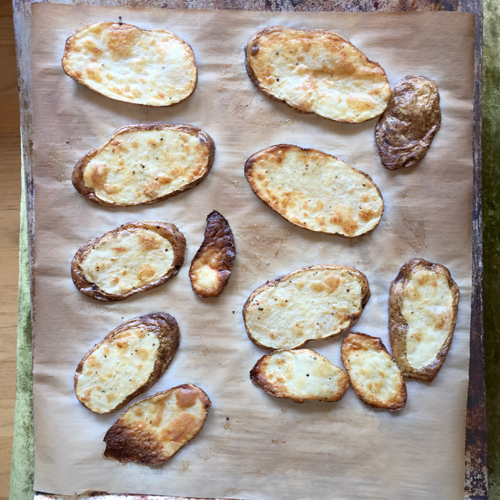 Bake potatoes at 450 degrees for 20-30 minutes, turning one time after the tops begin to brown. Remove from oven when they are baked to desired doneness. This one got cut a little thin and is just this side of burned. Still super tasty though. 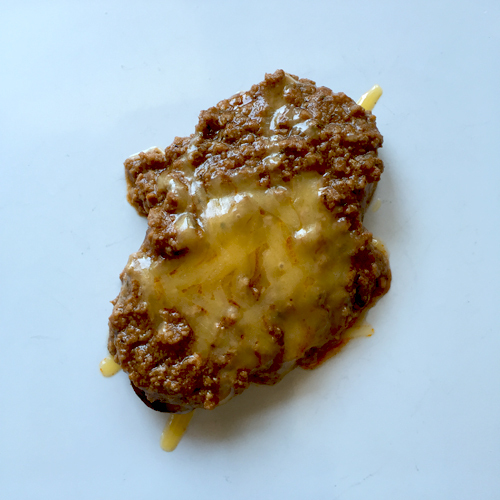 I enjoyed this one by slathering it with chili and cheese. So good.